The Roobois is a shrub that grows only in South Africa. The herbal tea made from its leaves is naturally caffeine-free, soyou can drink it long into the evening. There are many benefits to this colorful African red tea, such as being packed with Antioxidants that have a protective effect on our body. 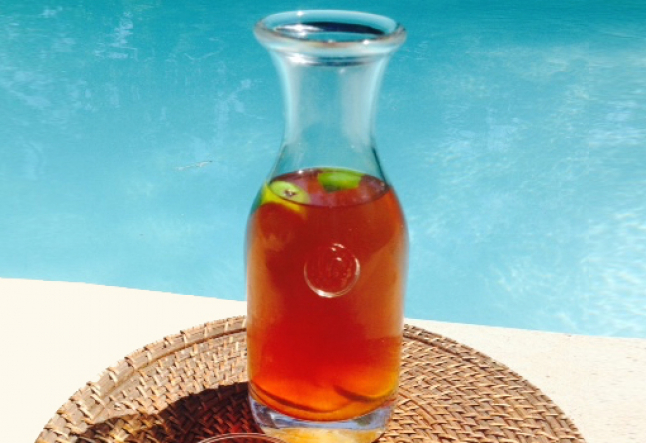 This Roobois/lemon iced tea is perfect for the summer heat and looks beautiful on the table. In a sauce pan, bring 3 cups of water to a boil. Remove from the stove and add 2 tablespoons of loose Roobois tea (or 3 tea bags). Let it steep for 5-10 minutes. Drain the tea into a glass jar. Add the juice of 2-3 lemons and 1-2 tablespoons of raw honey or organic maple syrup. Cut a few lime slices and add them to the jar for decoration. Place in the fridge and serve very cold with ice cubes.